Like the thought of keeping fish but lack the commitment? 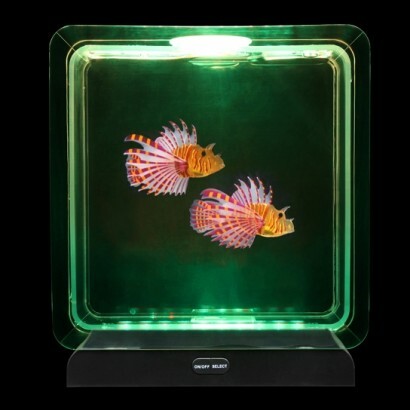 This colour change tropical fish tank contains two brightly coloured rubber Lionfish that swim in a realistic motion mimicking the real deal for mesmerising effects. The tank's lit with 30 colour change LEDs that shine through the body of the tank giving the fish a funky fluorescent glow and can be set to colour change or static light functions so that you can set the light to suit your mood. Perfect for relaxing, this hypnotic mood light is ideal for desktops and more giving an instant soothing vibe to your space.